When children have scoliosis, it means their spine abnormally curves to the right or left side of the body. 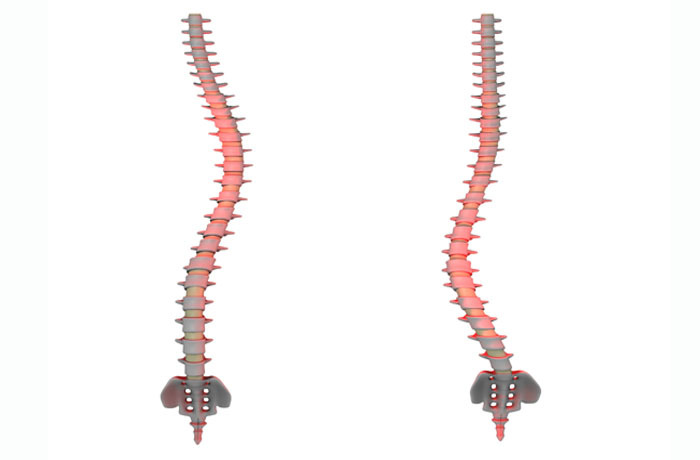 This spinal curvature can be moderate to severe. While scoliosis is sometimes caused by conditions such as muscular dystrophy or cerebral palsy, the cause of most scoliosis is unknown (idiopathic). The spine can be curved in scoliosis at any part. The most common parts affected by scoliosis include the lower part of the back (lumbar scoliosis) and the chest (thoracic scoliosis). Levoscoliosis: the spine has a single curve to the left and looks like the letter C.
Dextroscoliosis: the spine has a single curve to the right and looks like a backwards letter C.The spine curves twice, once to the left and once to the right, and looks like the letter S.